It seems that despite the USSR's disapproval of The Beatles, Soviet fans were as dedicated and passionate as their western counterparts. Their records, when smuggled in, were sold for small fortunes and it is said that The Beatles inspired a generation of schoolchildren to study English so that they could understand the lyrics. In Kazakhstan today Beatlemania is thriving. 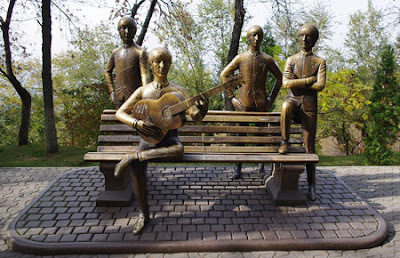 A bronze Beatle's monument on Almaty's hilltop park Kok Tobe was installed in 2007 and the path running along side it is named Beatles Avenue. There is a John Lennon alley in the capital, Astana, renamed to commemorate the 70th anniversary of his birth. According to Tengri News, in 2012 the Kazakhstan Bank RBK purchased a rare photograph of The Beatles for 16 thousand pounds. 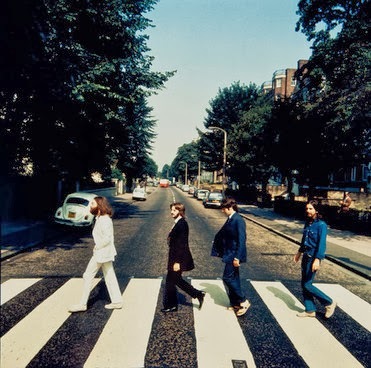 "The photograph is one of only six shots made in August 1969 by Ian Macmillan for a cover of their 12th album of The Beatles called Abbey Road. Although another shot was used for the album cover, the photograph purchased by RBK has significant historical value. Three main differences of the photo from the cover are that the singers are crossing the road in the other direction, Paul McCartney has no cigarette in his hand and he wears sandals". The photograph is on display at RBK's Almaty office at 13 Republic Square. Kazakh cities hold regular Beatles festivals and the band the Kazakhstan Beatles had a huge following until their recent breakup. They harmonise pretty well and you can listen to this interesting clip below [3 mins] of Nowhere Man followed by a brief interview with the musicians. (If you cannot view this on your device go directly to this link: http://www.youtube.com/watch?v=INd-Szm4qgY). The Kazakhstan Beatles fulfilled their dream and took part in the International Beatles Festival at the legendary Cavern Club, Liverpool, in 2009. Watch this 1-minute clip of the gig. And just for nostalgia, here is a link to the Fab Four singing Back in the USSR.